If I said the name, The Quarrymen, you probably would not believe the this is the best band of all time. What about Johnny and the Moondogs? Long John Silver and the Beetles? Sergeant Pepper’s Lonely Hearts Club Band? The Silver Beatles? If you haven’t recognized the previous names, you should recognize the name of this truly one of a kind band, The Beatles. The Beatles consisted of four of the most musically talented musicians to ever live; Paul McCartney, John Lennon, George Harrison, and Richard Starkey. The Beatles started as the skiffle group put together by John, The Quarrymen. Paul and George joined after seeing the group perform. The group, now consisting of Stuart Sutcliffe, Pete Best, Paul, George, and John, set of on their first tour of the clubs in Germany. The trip ended with George getting deported. They made many trips back to Germany and drug use was first present in the band. Stuart left and they started becoming popular with the single “My Bonnie” although this was credited to Tony Sheridan. The band got their manager George Epstein. The famous quote, “Guitar groups are on their way out, Mr. Epstein” came now as Decca Records rejected the band. Fortunately George Martin signed the band. Ringo Starr was the next and last to join the band after leaving Rory Storm and the Hurricanes. Then, Beatlemania started. In February of 1964 the greatest band on earth landed in JFK and were greeted by no less then three thousand people. Numbers don’t lie this truly was something special. Just two days later, the band appeared on the first time on the Ed Sullivan show and 74 million people tuned in. That’s 40% of the population at the time. The Beatles were more then popular, more then a lifestyle, they were a culture. In June of 1965 the group was appointed Members of the Order of the British Empire, a very prestigious award. If you think about it, that’s ridiculous. How could a band gain a government status, but then again, its ridiculous how good the Beatles were. The Beatles then went on to perform the first major stadium concert at Shea which also had the largest attendance at a concert ever. 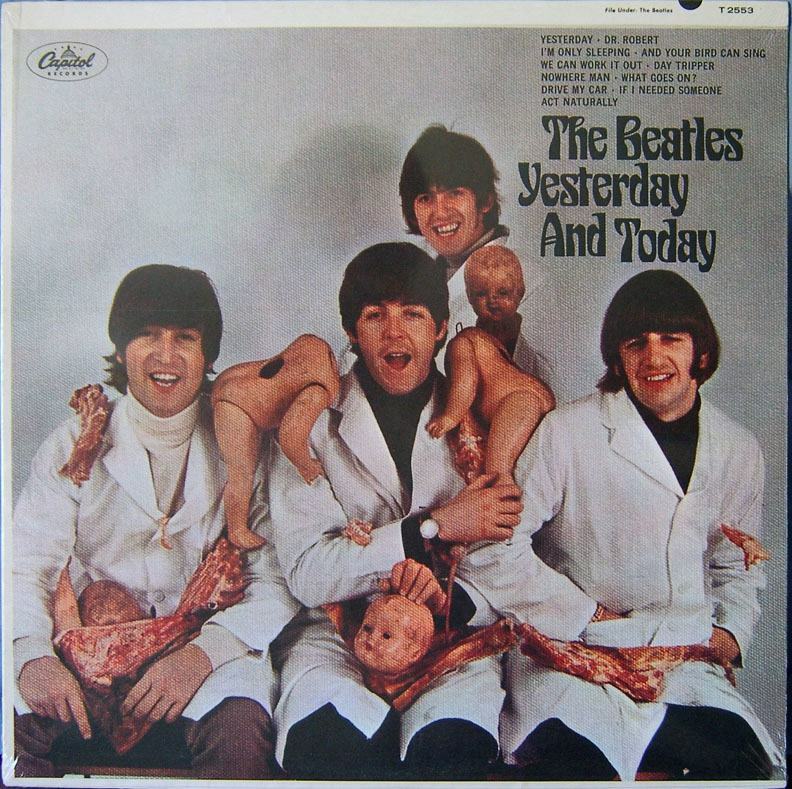 Fast forward to June 1966, the months where the controversial album cover of the Beatles with the mutilated dolls an them appeared. If pretty much any other band had put this out, it might not have been a big deal but this was the Beatles. So naturally, in 2005 an album with this cover sold for $10,500! The album Revolver came out and it did not have a group picture for the album art. The songs “Paperback Writer” and “Rain” which came out after, were the first songs with music videos. Another first that came after this was made by the album Sgt. Pepers. This was the first album to put complete lyrics on the back. The album art was also very different as it portrayed the group in colorful military style uniforms and thick mustaches. The group then took a trip to India after the death of Brian Epstein and this was credited as one of their most creative times, wherein the album The Beatles came out, otherwise known as the White Album. The cover of this had nothing but white making it revolutionary once again. This was another outstanding album although it brought the start of the breakup of the greatest band ever. The group ended their amazing streak together with Let It Be and Abby Road, the later of which was claimed by Allmusic to have “some of the greatest harmonies to be heard on a rock record”. Together as The Beatles the group was revolutionary. They recreated the concert, the album, the reach and influence of a band, they recreated music, style and essentially life. Many of their awards I have already talked about but some I have not. The Beatles won an Academy Award for their film Let It Be, and they had 7 Grammy’s, 39 Platinum albums, 45 Gold Albums and were inducted into the Rock and Roll Hall of Fame in 1988, their first year eligible for it. Billboard magazine listed them as the all-time top-selling hottest artist and they were listed in Time‘s 100 most influential people. They have sold more albums then anyone else in the U.S.. On Rolling Stone’s 500 greatest albums of all time, The Beatles took 4 of the top 10 spots, and they also took the number one spot with Sgt. Peppers. MSMBC ranked them as the best band ever. This list goes on and on but for pretty much any list you look up for greatest songs/albums/bands of all time, The Beatles will dominate. Every one of the Beatles also went on to lead very successful independent musical careers proving that the really had musical talent of their own and didn’t need to rely on the group. Paul McCartney had the most successful career. He is the most successful musician in history. He had 60 Gold Discs and sold 100 million singles. The most popular defiantly being Yesterday, the most covered song in history. It was covered by over 3,500 artists and has been played over 7 million times on American radio and T.V..
John Lennon also had an amazing solo career and did a lot as a peace activist and was ranked second, behind Paul, and the most successful artist of all time. George Harrison was listed as the 21st greatest guitarist of all time. He went on to record more music and also become a film producer. He died of lung cancer on November 29, 2001. Ringo was the best actor of The Beatles and appeared in many more films and TV shows with one of his more famous being the narration of Thomas The Tank. He also had a successful music career and is now touring with Ringo Starr & His All-Starr Band. The Beatles changed everything. They changed the world. They were the most influential band to ever be formed and it is impossible for any band to surpass them. They were the focus of the world since the 60’s and even still Paul and Ringo are under the microscope. They changed everything, even things that are not related to music. They pretty much invented the hippy along with all their other things. They created a new style, no they created a new generation, no The Beatles created a new world.